I travel every week end preaching for solid soul winning churches and I am thrilled to be of some help to encourage them in being aggressive personal soul winners. It is always exciting to be able to come home and go soul winning with my home church the Longview Baptist Temple where I pastored for 29 years. The soul winning is as great as ever at LBT. 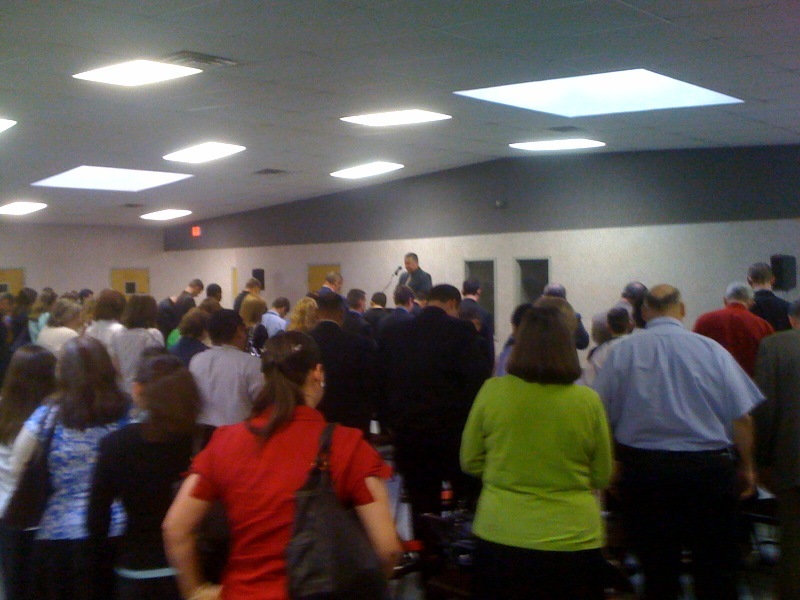 God allowed me during the month of March to see 51 people bow their heads and receive Christ as payment for their sins. 23 of those followed the Lord in baptism in a local church. Gotta love soul winning! If our local churches are to remain strong fundamentally then we need to be careful of whom we decide to emulate. If connecting the dots of a leader is pointed toward ecumenicalism then it only makes sense to WARN God’s people. Dr. Jack Hyles moved to the right through out his years of ministry and provided Bible principles for the next generation of conservative believers to keep moving to the right. If you connect the dots it would be obvious where he was and was headed. It was not to the “originals only” position concerning the Scriptures. Dr Hyles distanced himself from Dr. Jerry Falwell. This current young leadership in fundamentalism is drawing close to Dr. Jerry Falwell Jr. All you have to do is connect the dots. It will not be long until these dots connect to the Southern Baptist Convention and beyond. Truth is stable while change is unstable. Truth is finite while change is infinite. Truth has boundaries while change has no boundaries. Truth has restraint while change has no restraint. Once you leave truth you never stop changing; it just becomes worse and worse and further and further away from truth! Someone said about a preacher,”He changed his position.” NO! Change is a position! Change has no end to it! Be careful of this Rodney King mindset of, “Why can’t we just all get along” because it is a dangerous path! Why are those who stand for truth called rabble rousers anyway? You didn’t call Dr. Hyles that when he was a live. Many have chosen friendship and allegiance over truth and have checked their brains at the door of many a national meeting all under the banner of “souls.” Sounds like Billy Graham ecumenical teaching to me. By the way Dr. John R. Rice, Dr. Bob Jones Sr, Dr. Jack Hyles, and many other fundamental leaders paid a price for standing up to Billy Graham. Don’t destroy the orchard was their cry and they were right. There is a generation to follow that needs the strong orchards of local churches not a spiritual Mecca to go and admire once a year! God never intended for churches to unite. There is a difference between “union” and “unity.” God intended for local churches to have “unity” but not to become apart of a “union” of churches. It is a good thing when pastors disagree with pastors. The Jerusalem conference was a good thing. When Peter was withstood to the face it was a good thing! A pastor said to me about a leading Bible College that the President promised him that if the college ever changed he, the President, would be the first to say so! Excuse me but my faith is not in a human leader but in the Scriptures. The human at the helm is the one who has the power to lead it into change. My plumb line is the Bible not the boss! “But preacher the leader is sorry for all of the confusion he caused!” How about saying he was wrong to say the King James Bible does not contain preserved inspiration! The reason he cannot say so is because he does not believe the KJB is preserved inspiration! Thus your allegiance has caused you to back friendship instead of truth! I believe the King James Bible contains preserved inspiration and the other does not! How long halt ye between two opinions?